Harry Mavros wrote in reply to my two recent articles in Crikey, in which I was described aspects of the media treatment of Telstra CEO Sol Trujillo as employing racist stereotypes. The following is the full text of my reply to Mavros. I commend Harry Mavros for approaching the issue with some structure and intellectual rigour, and for playing the ball not the man. However, I’m sure we both deplore and reject racism not because of its underlying motivations but because of its awful consequences. While I acknowledge the distinction Mavros draws between “vulgar parochialism” and racism, I am far less concerned about issues of definition (those to which I referred as “technicalities”) than I am about the effects. Racism and vulgar parochialism are fellow travelers – Mavros acknowledges that both produce the same kinds of derision of culture and appearance – and most Australians can’t tell an epiphenomenon from an epiglottis. The argument isn’t about whether cartoonists and sub-editors are motivated by racism (I don’t believe they are) but whether their actions could promote racism. We appear to be in furious agreement that Knight's Trujillo cartoon is discriminatory and vulgar. But, as I made clear in both of my recent pieces (and my 2006 Crikey article), last Friday’s cartoon was just the latest episode in a long and troubling history. Sections of the Australian media have treated Mr Trujillo in this discriminatory and vulgar manner from the time of his appointment right through to the announcement of his departure. This and other cartoons, “cute” headlines like “Si senor”, nicknames like the “Three Amigos”, and radio stations playing the Mexican Hat Dance whenever his name is mentioned may look benign when considered individually. But for a very significant proportion of the Australian population, each of these repeated pairings – of Trujillo with a false, vulgar and discriminatory (Mavros's words) national and cultural stereotype – leverages existing prejudices and has the potential to engender fixed and absolute beliefs about racial inferiority. By humorously referring to Victorians as “Mexicans” (i.e. from “south of the border”), Sydneysiders have long tapped into the “Mexican” racial stereotype in order to imply, albeit gently, that Victorians are intellectually inferior, slow and lazy. 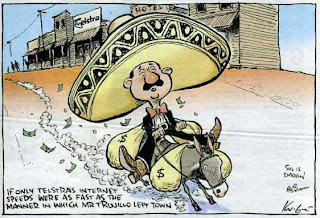 I have interviewed many Australian consumers who, based on the cartoon and movie stereotypes on which they have been raised, and bolstered by the information they get from trusted contemporary media sources, believe that: (i) Sol Trujillo is “a Mexican”; (ii) “Mexicans” are intrinsically (culturally, genetically, whatever) inferior to other “races” in intellect, competence and trustworthiness; and (iii) as a “Mexican”, Sol Trujillo was a poor choice as Telstra CEO and an incompetent manager. These people often have no basis for assessing Trujillo’s performance objectively. They see and hear others making fun of him because he’s “a Mexican” and, linking this to other (perhaps more reasoned) criticism in the media, make racially-based attributions about the reasons for his incompetence.Average German citizens and soldiers probably didn’t consider Jews genetically inferior until encouraged to believe this by Nazi propagandists. Indeed, they had to reject evidence to the contrary, namely that Jews in Germany included academics, musicians, scientists and business leaders. I am disturbed to have been accused by Mavros of recklessness for having raised the issue of racism. To deny racism on the basis of a purist argument about definitions and motivations is to be recklessly indifferent to the potential consequences of racial stereotypes and derision in the media. Whether born of racism or vulgar parochialism, the stereotyping of Trujillo irritates me for the reasons you have mentioned, but also because they erode the credibility and visibility of the objective, thoughtful criticism of a CEO I consider to have done a very poor job. The rightful condemnation of the childish (and seemingly endless) reference to his nationality by sections of the media, has taken attention away from the commentary that has focused on the way Telstra's service and customer focus has become (in my opinion) so much worse under his leadership. On a less serious note, I adore the fact that Sydnesiders refer to Melburnians as Mexicans. Implicit in the attempted jibe is the fact that this makes Sydneysiders Americans. At the risk of resorting to vulgar parochialism myself, I am, comparatively speaking, quite happy to be a Melburnian Mexican. Bienvenido a América, Señor Trujillo! It amazes me that, somehow, this is viewed as just playful humour. It seems to be okay to people because Mexicans are so uncommon in Australia. In jest or with malicious intent, I have to say that the "joke" is getting really old.